PRO: Re-signed as a free agent in February, 2015…signed with the Riders in June, 2009. 2018: Started 15 regular-season games at centre…missed the final three games due to injury. 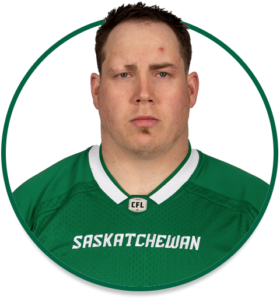 JUNIOR: Spent four seasons with the Regina Thunder…started every regular-season game in his final two seasons at left guard…named 2010 CJFL All-Star, CJFL All-Canadian, PFC All-Star and PFC Lineman of the Year…was a 2008 PFC All-Star selection.